A Little Shelf of Heaven: TGIF: BookTube + Interview with BookYAReview! REVIEW REQUESTS ARE CURRENTLY CLOSED. TGIF: BookTube + Interview with BookYAReview! Hey guys! Today I wanted to discuss BOOKTUBING! Aaaand I have a special guest as well! Okay, so basically, since I was 12ish I have been fascinated by YouTube and the people who make videos. When I was young, my mum convinced me that YouTube was a scary 'adult' website that I wasn't allowed onto. And then I discovered beauty videos. I LOVED watching makeup tutorials and fashion videos and stuff like that. I was a total girly girl during my pre-teen years and wanted to be able to do all the kind of things that they were doing. AND then Elle Fowler, one of my favourite Beauty Gurus at the time, began doing occasional book reviews on her channel...WHOO! I was fascinated. So I started looking up more bookish videos and came across a ton of awesome channels. THIS was right up my alley. There was a whole community of people talking to a camera about BOOKS. So, I was all 'WHOO LET'S GO FOR IT!' and then I realized that I'm super shy and awkward (aren't we all?). Anywho, I decided one day, enough was enough. It was time to do what any good writer does: research for information. What better way to get information that go straight to a primary source? So I contacted one of my FAVOURITE BookTubers and (at the time) somewhat bloggy friend (now I consider us actual bloggy friends... I just hope he does too ;D). 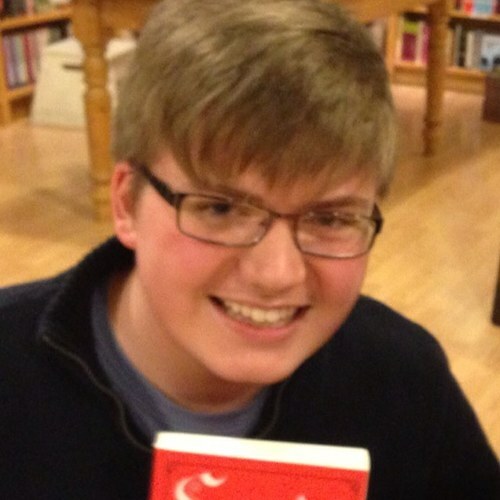 So, without further ado, I introduce to you... BRAD, AKA the mastermind behind BookYaReview! why yes, yes I did steal this from twitter. Okay, so this is Brad. He's a totally awesome and amazingly sweet book blogger and book tuber from Tennessee. He has one of the most epic book collections I've ever seen and is one of the nicest people I virtually know. Brad also has an amazing personality that shines through his writing as well as his videos! PLUS he has an adorable accent and huge smile that I can't resist smiling back to, even though he can't see me. Brad is one of the first bloggers that I started interacting with on twitter and I am so go honoured to host him here on A Little Shelf of Heaven! If you have not checked out Brad's blog or YouTube channel, GO DO IT NOW!!!! (links at the bottom of this post) Now, here's what he had to say about BookTubing! So I've been pondering the idea of starting weekly vlogs, as well as filming some book hauls and monthly wrap ups. Do you have any advice for an aspiring vlogger/book tuber? Two words: Have fun. I know everybody says that, but it really is true. Once you enter the Booktubing community, you will besurrounded by thousands of other book lovers! Make friends - comment on other people's videos and make connections! The friends that I have made through Booktube are the best bookish friends I have. It's so much fun to make videos about books! And finally, don't worry about the trolls! If you get a dislike or a negative comment, just ignore it; that's what I always do. Think about the friends you've made and how much you love to talk about books! We're readers; it's what we do! What made you want to start filming bookish stuff? Did you start vlogging or blogging first? I actually started blogging first! I was very new to everything, so the content wasn't great. Then I discovered videos about books on YouTube and fell in love with it. I made my first video in August 2011 (an introduction and unboxing video! ), and I have to say that looking back, I'm not a fan of it (haha!). Then I took, for whatever reason, a break, but then came back in January 2012, and since then, I've never looked back! I had loads of inspiration for starting my YouTube channel; one was ILoveReading65. I ADORED (and still do!) her videos! She was the first Booktuber I ever watched, and she definitely inspired me to make my own content! You write your reviews on your blog, instead of talking about them in videos. What made you decide to do that? I felt that they were a lot easier to write reviews instead of film. I would love to film reviews, but I feel like Monthly Wrap-Ups are so much easier! And plus, my poor computer probably couldn't handle the memory I would put on it with review videos! If you could only have your YouTube channel or your blog, which would you choose? HARDEST. QUESTION. EVER. With my YouTube channel, I get to interact with people and have a face-to-face connection; plus, I have some amazing and talented friends who I love talking to! But with my blog, I love to post reviews, do memes, and comment on other blogs! I can't choose! Has BookTubing helped your confidence grow? Absolutely! I think I was confident back before I started Booktubing, but now, thanks to Booktube, whenever I meet a reader and bookish person, I'm a chatterbox! I absolutely love getting to meet readers and share what books have been good that we've read recently! Fun story: I met a girl in line for a Marissa Meyer who also loved Incarnate by Jodi Meadows, which is my favorite book of all-time. I may or may not have freaked out. But in short, yes. Booktubing has helped me in so many ways. Not in just learning about new books and bookish people, but helping me in my day to day life! Food - Steak/chocolate chip cookies! Book - Incarnate by Jodi Meadows! Thanks so much for having me on your blog today, Kristy! It was so much fun! You know, BookTubing sounds really cool! I've been so nervous about starting, but I think I will this summer. Probably a mixture of bookish videos and random vlogs....I'm not sure! Thank you so much for coming onto the blog today, Brad! MAKE SURE YOU GO CHECK BRAD'S BLOG/CHANNEL OUT!!! As of now, A Little Shelf of Heaven is an award-free blog! I really appreciate them, so so much, but I just don't have the time to pass them along to other blogs! Design by Seo Evie. Powered by Blogger. Hey there, I'm Kristy! Thanks for stopping by! I'm a '97 baby, born and raised in BC, currently studying English Literature in Ottawa. In accordance with the new FTC Guidelines concerning blogger endorsements, A Little Shelf of Heaven would like you all to know that all of the books reviewed on this site have either been purchased by myself, borrowed from a library, received on tour or received from the author/publisher with no form of monetary compensation (unless otherwise specified).